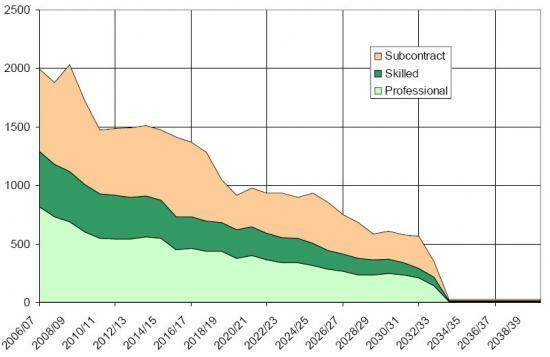 UKAEA Dounreay today published updated figures about employment at the site and projections of reducing manpower needs as more of the fast reactor experiment is cleaned out and demolished. Current employment levels of approximately 2000 are expected to reduce by 500 over the next five years. Upon completion of the decommissioning programme in 2033, employment will have reduced to 23. UKAEA is developing new plans to bring forward the completion date to somewhere in the 2020s. UKAEA Dounreay acting site director Simon Middlemas said: "There are overwhelming safety, environmental and security reasons for completing the clean-up and demolition of the site as quickly as it is safe to do so. But I recognise that closure of the site and the inevitable loss of employment in decommissioning has major social and economic consequences. That is why UKAEA, supported by our business partners AMEC and CH2MHILL, welcomes today's announcement and will continue to work closely with Caithness and Sutherland Enterprise and other partners to support the regeneration of the area's economy."